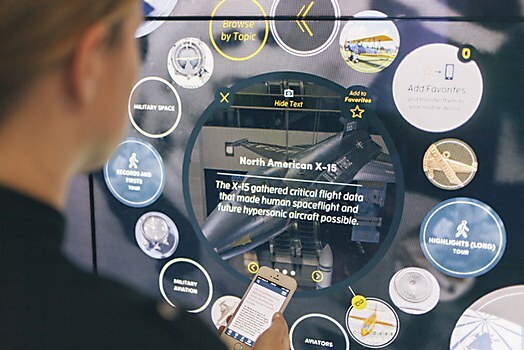 From the Apollo 11 Command Module to the supersonic Bell X-1 plane, Bluecadet’s touchscreen wall helps visitors discover the National Air and Space Museum’s many relics. The Apollo 11 Command Module, the Space Shuttle Discovery and the fastest jet in history are just some of the fascinating things you can find in the Smithsonian Institution’s National Air and Space Museum. 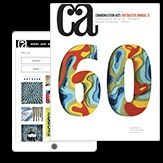 When the most popular museum in America asked Philadelphia-based digital agency Bluecadet to reimagine its visitor experience in honor of its 40th anniversary, Bluecadet gladly accepted the mission. 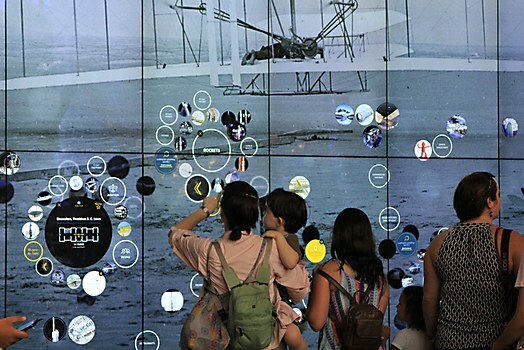 In order to produce a more interactive, powerful and educational visitor experience, Bluecadet built an experiential strategy that starts the moment visitors walk into the main exhibition gallery and continues to drive exploration long after visitors head home. 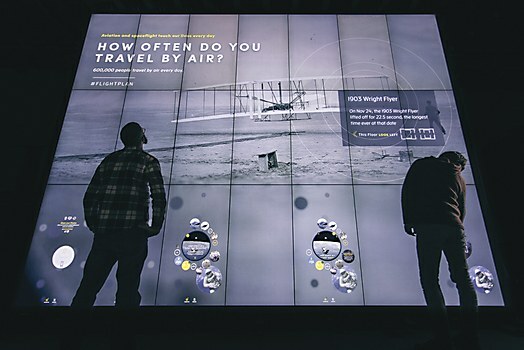 The visitor experience begins with a massive 200-square-foot touchscreen wall in the Boeing Milestones of Flight Hall. Walk up to the wall, choose a topic and immediately see objects from the museum’s collection aggregated through the museum’s collections management database. A single tap brings up a constellation of related topics and museum objects, inviting you to continue exploring. If you follow an interest in, say, the Apollo 11 Command Module, you can easily chase it a few steps to find yourself learning about the supersonic Bell X-1 plane. The museum’s new smartphone app also works in tandem with the wall, so you can add objects to a list of favorites as you explore them on the wall. Stock up a tidy little list and sync it to your phone; now, you’ve get a tour designed just for you. 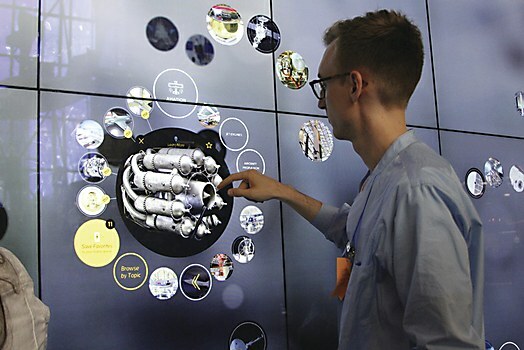 Of the more than 54,000 people who visited the National Air and Space Museum for its grand reopening, those who used the interactives were able to see history reimagined for a digital world. 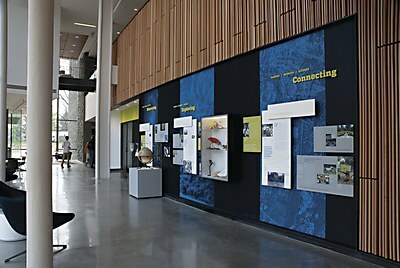 Housed in Vassar College’s new Integrated Science Commons, exhibitions by Poulin + Morris honor the college’s scientific achievements.